The name Giganotosaurus stands for ‘giant southern lizard’. The name is probably derived from the fact that the fossils of Giganotosaurus were discovered in the Patagonia region of southern Argentina. The name is pronounced as ‘jig-a-not-oh-saw-rus’ and this dinosaur was named by Rodolfo Coria and Leonardo Salgado, as recent as 1995. The Giganotosaurus was a carnivore and this meat eater fed on other large, plant-eating dinosaurs that roamed the earth at the same time. Its teeth were used more for cutting, rather than crushing and it had a good sense of smell. 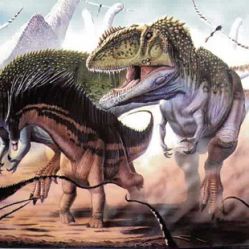 The Giganotosaurus was between 44 and 46 ft long and stood 13 ft tall at the hips. It weighed 8 tons and walked the earth during the cretaceous period, which is nearly 110 million years ago. Giganotosaurus fossil remains were first unearthed by Ruben Carolini, who subsequently also lent his name to the species – G. Carolilii. Giganotosaurus is believed to have been longer than T. rex! It belongs to the phylum chordata. This indicates that the animals had a hollow nerve chord that ended in a brain. They had socket set teeth and the lizard-hipped dinosaurs were bipedal or two legged. The carnivores were advanced theropods. Giganotosaurus had a brain that was the shape and size similar to that of a banana! As its name suggests the Giganotosaurus is considered by scientists to be the largest of the terrestrial carnivorous dinosaurs, even larger than the ferocious predator Tyrannosaurus Rex. The Giganotosaurus was a member of the Carcharodauntosaurid dinosaurs who were a group of ultra large theropod dinosaurs. The Carcharodauntosaurid family contained some of the largest carnivorous predators of all time, apart from the Giganotosaurus other members included the Mapusaurus, Carcharodontosaurus, and the Tyrannotitan. The family to surpass the Carcharodauntosaurids in size were the Spinosaurids. The Giganotosaurus was a mammoth sized carnivore which measured around 45 ft in length and weighed a little over 6 tonnes, surpassing the T. Rex by a small margin. Like most Theropods the Giganotosaurus had a prominently visible and large head and is believed to have possessed the longest skull among the various theropod dinosaurs. With such a large skull there was space for a very well developed olfactory region suggesting an extremely sharp sense of smell. However it’s worth mentioning at this point that skull size isn’t everything, as despite the Giganotosaurus having a larger skull its brain was almost half the size of the Tyrannosaurus. Now compared to the T. Rex whose teeth were ideal at snapping and cutting through bone, the Giganotosaurus had much smaller, narrower and more evenly sized teeth. This would have made them ideal for slicing flesh and leaving deep cuts in their victims as opposed to the bone crushing effect that the T. Rex had. Thanks to its size, scientists believe the Giganotorsaurs was more than capable of going after the super sized herbivores such as the Argentinosaurus and the Titanosaurus. In fact Titanosaur fossils were found extremely close to those of the Giganotosaurus making this an even higher possibility. In terms of hunting style unlike the Tyrannosaurus who was a solitary hunter scientists believe the Giganotosaurus may well have been a pack hunter. The reason for this stems from the study of the other Carcharodauntosaurid dinosaurs whose fossils were often discovered in groups, indicating a collective hunting or herd like grouping. With the Giganotosaurus this is even more likely as going after the super sized herbivore giants would have been no easy task on ones own, but as a pack it may well have worked quite well.